Published: April 4, 2012 at 12:32 p.m. 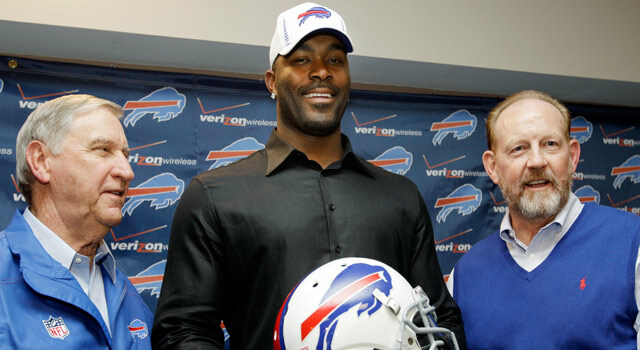 Acquiring Mario Williams in free agency allows the Bills more flexibility when it comes to draft strategy. In a recent conversation with Indianapolis Colts GM Ryan Grigson at the Palm Beach airport following the annual league meetings, the first-time decision maker told NFL Network the best advice he's been given about his new job is to stay true to his roster-building principles. The former Philadelphia Eagles staffer said that entails drafting the best player available, regardless of position. Seeing as though the Colts hold the first pick in the draft and early selections in the following rounds on a gutted roster devoid of top-shelf talent, Grigson basically could play pin-the-tail-on-the-donkey in every round because so many positions have to be addressed. The St. Louis Rams, Minnesota Vikings and Cleveland Browns -- three other teams with high draft positions -- are pretty much in the same situation. They have so many areas of need that it doesn't matter who they pick. It could be a cornerback, wide receiver, tackle, running back, quarterback, whatever. Then there are teams that have done enough things in free agency to where their draft boards can be re-made. Although there still might be needs, acquiring talent with the best players available could actually strengthen their roster more than simply plugging gaps. "Drafting for need is more of a short-term fix, whereas drafting the best player available tends to serve you better in the long-term," an AFC general manager said. Before free agency, the Bills seemed destined to use the 10th overall pick on a pass rusher. They're switching to a 4-3 scheme and needed pass rushers to have any shot of threatening Tom Brady and the Patriots. But then they made the biggest monetary splash in free agency by signing defensive end Mario Williams from Houston, as well as DE Mark Anderson from New England. By extending wide receiver Stevie Johnson, it also de-emphasized the need to go that route early in the draft. Buffalo could still choose a pass rusher or wideout in the first round, but it has given itself options to target offensive tackle (Iowa's Riley Reiff? ), linebacker (Boston College's Luke Kuechly?) or even cornerback (South Carolina's Stephon Gilmore?). The free-agent signing of Brandon Carr fills the cornerback void caused by the release of Terence Newman, and adding Dan Connor to team with Sean Lee at inside linebacker offsets the free-agent loss of Keith Brooking (and possibly Bradie James). There are still holes along the offensive line at guard, as well as safety, but the needs at cornerback and inside linebacker would have been more glaring if they weren't addressed in free agency. With the 14th overall choice, Stanford guard David Decastro addresses a need, but the Cowboys also could do right by selecting Alabama safety Mark Barron, Michael Brockers or Fletcher Cox (both defensive tackles) or cornerback Dre Kirkpatrick. The second-rounder could be used on a tight end to replace Martellus Bennett or on a cornerback, offensive lineman or wide receiver. The Cowboys still will be devoid of some needed leadership. The Bengals have picks 17 and 21 and have the ability to draft for need (cornerback) and for luxury/depth/talent infusion. They helped the process, though, by re-signing safety Reggie Nelson, who resurrected his career under defensive coordinator Mike Zimmer. They also kept CB Adam Jones. Two understated pickups were running back BenJarvus Green-Ellis and guard Travelle Wharton, who is versatile enough to play tackle if needed. The Bengals could (and should) add another cornerback -- although they signed Jason Allen in free agency -- and/or a safety because they face a slew of receiving threats against Baltimore and Pittsburgh. Those aren't glaring holes, but Alabama's Barron, North Alabama's Janoris Jenkins or Alabama's Kirkpatrick could provide short- and long-term help in the secondary. Beefing up the linebacker unit and adding another wide receiver and running back should not be ruled out either. There are no huge holes, but Cincinnati has an opportunity to add playoff-push depth and talent. The Chargers looked like they were surrendering to the process when they allowed WR Vincent Jackson and RB Mike Tolbert to walk and then cut tackle Marcus McNeill. But they rebounded nicely with the acquisitions of RB Le'Ron McClain, OLB Jarret Johnson and the collective wide receiver combo of Eddie Royal and Robert Meachem. The retention of tackle Jared Gaither also was important. San Diego can go a lot of ways after these moves, although offensive line is what needs to be bolstered for now and years to come. Tackles Cordy Glenn or Jonathan Martin might be too hard to pass up. The same might be said if Kuechly slips or Alabama prospects Courtney Upshaw or Dont'a Hightower are available. It might seem like a reach, but would anyone be stunned if San Diego added a wideout if Notre Dame's Michael Floyd slipped to 18? With Peyton Manning in the AFC West now, the Chargers figure to add to the secondary as well. With the bounty scandal and its punishments putting the Saints in uncharted territory (losing their coach and likely having players suspended), the franchise has done an excellent job stockpiling talent and depth in free agency. They've signed linebackers Curtis Lofton, David Hawthorne and Chris Chamberlain and defensive tackle Brodrick Bunkley, which actually might provide them with more talent on defense then they've had. Adding Ben Grubbs at guard should help compensate for the loss of free-agent Carl Nicks and subdue some of the concern about maintaining the offensive continuity without coach Sean Payton. With no first-round pick and the second-rounder stripped in the bounty sanctions, the Saints had no choice but to be proactive in free agency, despite salary-cap constraints. New Orleans finally gets back into the draft game at the back end of Round 3, when teams are usually picking the best player available anyway. But the ability to lure in players under these circumstances eases some of the burden to get it right.